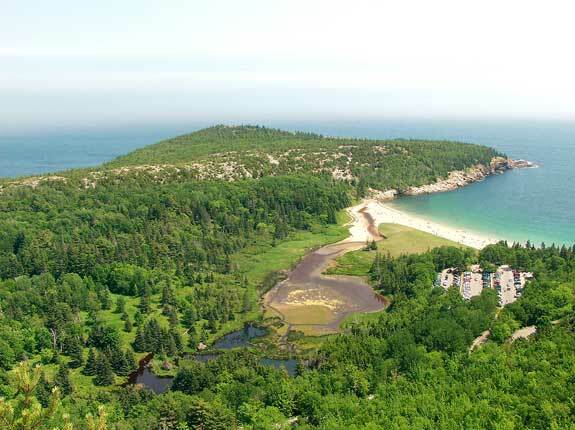 DownEast & Acadia Maine, a region well known for its’ lobster, lighthouses, and Acadia National Park, boasts some of the most scenic coastline in New England. Some of the more popular recreational activities include whale and puffin watching, sea kayaking, hiking and biking along the coast to fishing, hunting and canoeing in the interior lake areas. Sightseeing attractions include Quoddy Point Light, the easternmost lighthouse in the U.S. to Campobello, FDR’s summer home located across Passamaquoddy Bay in Canada. Maine Event highlights feature everything from the Lobster Boat Races and Blueberry Festival to numerous music festivals and art shows. To see maps of: Hancock County and all towns & cities in the county, click here; Washington County and all towns & cities in the county, click here. Other towns and areas of interest include: Gouldsboro, Southwest Harbor, Stonington, Castine and Lamoine (Hancock County); Lubec, Baileyville, Eastport, Jonesport, Charlotte, Cutler, Dennysville, East Machias, Edmunds, Machiasport, Milbridge, Perry, Pembroke, Trescott and Whiting (Washington County). *Population figures are based on 2010 Maine census estimates. Eastport, Maine (Washington County): January: 29.7 to 13.9, April: 48.5 to 32.8, July: 72.9 to 53, October: 55.7 to 40.8. Hundreds of miles of rocky shoreline, a fjord, and numerous offshore islands, including Acadia National Park on Mount Desert Island; Cadillac Mountain on Mount Desert Island rises 1,527 feet and is the highest point on the North American east coast; Town of Lubec – easternmost point in the U.S.; Near Calais – highest tides in the continental U.S.; Grand Lake Stream Area – hundreds of lakes and ponds; St. Croix River – borders New Brunswick, Canada to the east. Winter Harbor: Schoodic Section of Acadia National Park, Winter Harbor Museum. Biking, Hiking (Acadia Nat’l. Park, Moosehorn National Wildlife Refuge, and area state parks), Boating & Sailing, Cruising (Isle au Haut, Deer Isle, Swan Island, Cranberry Islands), Canoeing (St. Croix River), Whale Watching (Bar Harbor), Sea Kayaking, Freshwater (Grand Lake Stream) & Saltwater Fishing, Golf, Cross Country Skiing.